Mariners Latest: Midway Through, What Changes Should The Mariners Make? Midway Through, What Changes Should The Mariners Make? We all know that changes are coming for our Seattle Mariners, but just what changes may we expect Jack Z and Erick Wedge to make during the All-Star break? Considering that just about every person on the team is hitting under the .250 mark with the exception of those that don't or haven't played every day. That being Casper Wells and John Jaso who are both hitting in the .260's. They are pretty horrid numbers to look at for a team as a whole and we can't send down everybody. The question is, where should the Mariners start? I wanted to break it down position by position. From catcher to right field, I'll give my thoughts and suggestions on how we should move forward in the second half. Miguel Olivo is our veteran backstop. Although he may not be the best catcher and isn't hitting a great deal, he is a workhorse behind the plate and probably best at working with our pitchers. He will stay. John Jaso, he is one of the better bench players that we have seen in a while and holds the highest average on the team at .267. Jaso is an asset at this point and should remain on the 25 man roster. That leaves Jesus Montero. Montero sat out the last couple games with concussion like symptoms after being hit in the mask after a foul tip. It isn't the first time that Montero has sat out due to minor injury and he continues to struggle at the plate as we've watched his average slip to just .245 and in his past 10 games he is 3 for 32 which translates to a .094 AVG. Montero is a great offensive threat and a true hitter. We saw it last year when he was called up by the Yankees and we've seen glimpses of it this year, but, I truly believe that Montero would be best served going down to AAA and regaining some confidence. That would bring an open slot at catcher, unless the M's would want to run with just two. Totally doable with Jaso and Olivo, but if they needed a third option, Guillermo Quiroz (right) is hitting .307 in Tacoma with 9 homeruns. Not an answer to any problems, but worth a look if we needed that 3rd catcher. Justin Smoak has been dismal at first base. There isn't any reason that he shouldn't go down and spend a little time working out his swing and getting back on track in AAA. With a lot of these young players, I think that a lot of these struggles are mental and can be fixed. I am not on the side to believe that Smoak is a bust. Yet! If we were to send Smoak down, who is our option at 3rd base? Well, that would depend on what would happen to Dustin Ackley and Mike Carp. Our only other options is AAA, DH, Luis Jimenez (right) who is hitting .318 with 13 homers and 52 RBI. 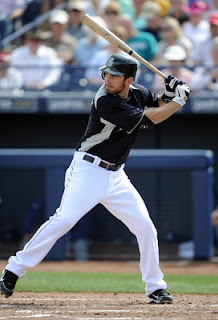 He has been a career minor league player that was signed by Seattle in January 2011. He hit .285 last year in Tacoma in 74 games and may be worth looking at at the MLB level if Smoak goes down. Dustin Ackley, a lot like Smoak, has been a real disappointment so far this season. Not a bust by any means, but when you compare the 2nd pick overall in the 2010 First Year Player Draft to the number 20 pick in Mike Trout, it can make you pretty frustrated. Ackley has been through a lot since being signed by the Mariners and now that the dust has settled we can see that he is really struggling at the plate. I think Ackley will stay at the MLB level and they are going to keep him at the number one spot in the order. I wouldn't be surprised to see him taking some more games at 1st base to relieve Smoak. Kyle Seager has slowed down a bit since his outright tear he was on at the beginning of the season, but I believe that he will get some time to adjust at the MLB level as well. Seager has been clutch for this team and leads the league in two out RBI. He's not going anywhere, but, it wouldn't surprise me to see him move over to 2nd base some. Brendan Ryan is a horrible hitter, we all know that. But, his defense is far better than anybody elses in the Major Leagues that the Mariners are going to stick with the Ryan, Munenori Kawasaki combo. Nick Franklin and Carlos Truinfel have not adjusted yet to AAA pitching and there should be no rush to bring either of those guys up at this point. I am going to lump all these guys together due to the fact that I don't foresee any changes coming. Casper Wells has been one of the best hitters since coming back from Tacoma and won't be going anywhere. Ichiro Suzuki is Ichiro and we all know that he's not going anywhere. Michael Saunders has been struggling again, but, without Franklin Gutierrez on the roster the team really needs his glove and athleticism in center field. Saunders is the lone candidate in this outfield that could go down in my opinion as he is hitting just .257 and .189 in his past 10 games. It's not going to happen though. The only other players that are not mentioned are Chone Figgins and Carlos Peguero. I would bet that we start seeing a lot more of Chone Figgins in the second half. In an effort to raise his value and to fill in some infield gaps that may be created, he's a useful tool on the roster. Carlos Peguero would see some more time at DH if Montero is sent down but would have a really short leash if he can't figure out Major League pitching. I really would love to see Peguero start mashing the ball all over the place, but to this point in his three games since being called up, he has already sat one game. Not the best way to get a good look at someone. So, I see Justin Smoak and Jesus Montero spending some time in AAA and it's possible that Ackley could spend some time there as well, but not likely. Only time will tell, but something has to happen and something will happen. One less catcher means the DH spot opens up a bit for Peguero and two 25 man roster spots open up if Smoak is gone as well. I would look for those to be filled by Franklin Gutierrez and a pitcher. I don't think they'll continue with the trio of catchers. As frustrating as this season has been, we knew what we were in for when it began. On the other hand, I feel that we are worse today then we were a year ago. That's a problem. I think Wedge has 3 months to start righting this ship, otherwise he may be looking for new work at seasons end. Don't be surprised.